Louis Ferdinand Céline (the pseudonym of Louis Destouches) was a famous novelist and ferocious anti-Semitic pamphleteer who rose to fame before Hitler, but perfectly represented the fascist mind-set that swept across Europe between 1932 and 1944. Never a Nazi himself, he was author of Journey to the End of the Night, Death on the Installment Plan, Guignol's Band, Homage to Zola, and a series of "pamphlets." The latter are a potpourri of racist editorials, ballet scenarios, and anti-Semitic confessions so violent that an aesthete like Andre Gide thought them parodies of other anti-Semitic literature. Little wonder the Nazis regarded Céline as a fellow-traveler. He retreated with the Nazis across the Rhine and sought refuge with them, first in Germany and then in Denmark. In 1951, he benefitted from an amnesty as a wounded veteran of both World Wars. Before his death in 1961 he had regained his popularity with the public and was regarded as a classic writer. 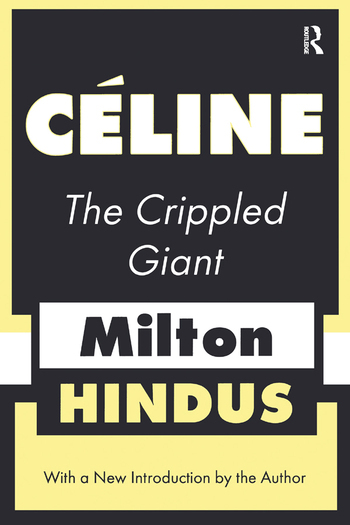 Now that the body of his work is in translation, Céline's fame in the literary world circles the globe.Céline, perhaps more than any other analysis, helps shed some light on this enigmatic figure. It establishes his literary importance, and, at the same time, examines his anti-Semitism. After a final meeting, Hindus declared that "Celine is a splinter in my mind that I've got either to absorb completely or eject completely." The reader of this fascinating critical memoir of one of the twentieth century's most controversial literary figures is apt to be left with a similar dilemma.